Published on Tuesday, January 27, 2015. How do digital technologies figure in your work? How did you come to them? The crux of the argument by both early digital fabrication makers (RepRap in particular) and William Morris is that decentralized forms of manufacture allows power to rest in the hands of makers, not those that corral their efforts for profit. These conversations figure into my work because I am drawn to making, and to craft, because they are forums in which to build an alternative space for living and making meaning. The action of making with one’s hands is connected to our earliest human impulses to bring form to an idea. 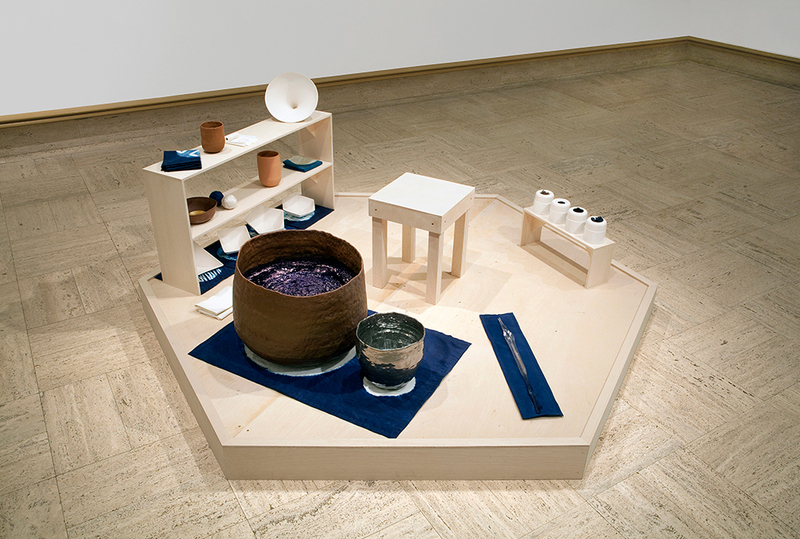 From the earliest pots created to sustain a localized community, to the forming of ritual objects to signify energies that surround our human communities, to imagining alternatives to mass culture, what we call craft continues to offer a space in which to enact this striving. Digital fabrication is part of that for me, among a multitude of other endeavors. What did you hope to accomplish with "New Morphologies"? If anything, what outcome or result surprised you? My ambition as one of the curators of “New Morphologies” was to expand what we expect from the meeting of “making” with “the digital.” I was not interested in showing objects that were a sort of “best of” collection of objects made using digital fabrication. That conversation is limited in ways that I don’t think suit the digital, especially in terms of singling out particular makers and particular objects. Through digital fabrication the myth of a static, fixed maker is abandoned. The idea of a static, fixed object is also abandoned. My aim was to investigate what this means for objects. At no time in history has maker or object actually been fixed. They have always been dependent on context, on associations developed through use. The individual maker has always been dependent on those around them, those that prepare their materials, those that teach them their skills, or use their objects. But that doesn’t mean that this myth hasn’t been dominant. But now in the digital, these traits of dispersed creation and un-fixity are both made apparent and increased to an exponential degree. This means that objects are revealed to be provisional though they may still find form that appears stable and fixed. In current digital/making practice, the network of relationship that surrounds objects and making is increasingly revealed through such things as forums of shared images, information, tutorials, and other documentation of processes and user experiences. This also means that the relationship between the object and the viewers, between the objects and those that use it becomes a site of investigation, and of exhibition. 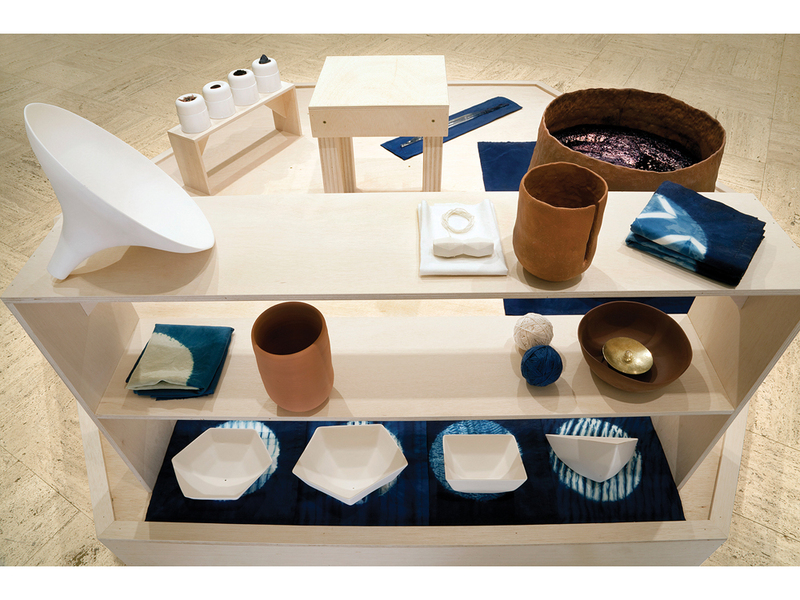 The objects chosen for “New Morphologies” were suggestive and provisional, and made no assumption of singular narrative of what digital fabrication is within the field of ceramics. Many in the audience of that show at Alfred were very willing to engage in this conversation. But there was also a very strong desire for the curators to say this, this is ceramics meeting the digital, this is what it looks like, what we can expect. It became important to me as a curator to assert that such specificity is impossible in the digital. Materiality becomes linked to the virtual and accumulates some of its quicksilver nature. At this point no retrospective viewpoint is possible (and may not become relevant again in this digital era). The action of materiality meeting the digital does not allow access to overarching narratives. This may be because it is too soon. But I also think it’s because the nature of the digital does not provide easy access to cohesive or all-encompassing constructs. An emerging maxim associated with digital fabrication is that it is best applied in cases where the hand alone could not have achieved the result. Do you agree or disagree? Why? I’m not sure maxims like this are relevant in the atmosphere of the digital. The digital is far too fluid for such assertions to hold water for long. The digital’s quicksilver nature subverts such totalizing assertions both in its changeability and in its multiplicity of voice and experience. Assertions of what is the “best” thing for a maker is also troubling for its proximity to arguments for a singular moral perspective and assertion of power and control. I do think that like any other technology the reason for choosing digital fabrication should support the intention of the maker. Digital fabrication works in tandem with the hand, not as a supplanter of its limitations. Digital fabrication and the hand are not two opposites, which are pulled singularly out of the maker’s quiver. This requires continuing to rethink what we imagine the body to be, which is challenging, but also poetically rich and reflective of the ways our bodies now extend through space and time by way of the virtual. With every advance in technology, since our earliest ancestors, the human body has extended what it was capable of. This has never made us less human, or less embodied, rather more so. However, currently in the everyday experience of the digital our perception of events is most often filtered through the visual, intellectual, and minimally tactile. In practice this has translated into a dislocation of the body. It is important to consider what is at stake when our sensual experience, our desires and will are only manifest behind glass. With the emergence of digital manufacturing technologies, this gap between the ideal and the real begins to close. For makers whose work is specifically located in the body, such as clayworkers, the virtual seems to threaten a dislocation from the primary location of skill, knowledge, and meaning. However, such makers can now offer an example of how the body can remain present in the virtual. In their work the body and the virtual are synthesized. Thus digital fabrication can actually represent a replacement of the body in the virtual, what was once ephemeral brought forth into materiality, into presence. This body awareness brings a humanization of the digital, making it an extension of our human bodies and our human skill. It reveals the materiality of the virtual and the digital. These things are reliant on material for their revelation, and in fact always have been. It could be said that the digital desires physical manifestation; it desires to be a body. What’s the greatest potential of these tools/technologies? What have you seen that most excites you? What most excites me about digital fabrication are the ways in which it continues to enact our very human striving to bring form to an ideal. In digital fabrication this ideal space is the 3D axis of a digital modeling program or a set of algorithms, but it is only a small leap to connect this to other ways in which human culture have created forms from intangible systems, such as star constellations, the interaction of natural elements, or the progression of the seasons. It is the poetry inherent in bringing material form to digital information that most excites me. The ways in which digital fabrication can make material what was once information is a profound step in the continuum of human technologies. Another of the traits of digital fabrication that most interests me is the ways it can change how we think about making and thus how we think about the body. Imagining the body as a static entity is too close to imagining identity as a static reality. The assumption that these things are static allows them to be controlled by a culture’s prevailing powers. This must be continually challenged in order to allow a multiplicity of voices to emerge. The line that is sometimes drawn in these conversations between the maker and the machine creates a boundary that is not reflective of the shifting multiplicity of experience. Those boundaries aren't policed by reality, but perhaps by our will to control reality, or perhaps just to communicate it. In my mind complexity and contradiction are not things to resolve, but allow nuance and richness to enter. These technologies represent an entry point to rethinking what it means to be a maker, and to be a body. The work made using these technologies that most interest me are reflective of this blurring of boundaries, such as ways it allows collaboration across locations such as the Open Structures project. Other work I am excited by attempts to dismantle the boundaries of proprietary control that capitalism strives to maintain, such as Open Source Ecology. You sometimes hear the statement that technologies are simply new tools – and in many ways, yes, absolutely. But compared to manual tools, there are distinguishing traits. Hands-on feedback may be reduced, for example. A program can prevent a design flaw. Does this matter? Do digital fabrication tools have the potential to change how we think about making? The ephemerality of digital information is inherently destabilizing to a traditional understanding of making in material form. There is an ephemerality that is introduced to the making that seems counter to the physicality that draws so many of us to making in the first place. But the process of using the digital is a manifestation of the way humans have created since the beginning of our time as humans. When we approach the digital it is through an interface that offers us a blank space, a void in which to call out form. In this space our tools become the point, the line, or a manifestation of numbers. It is essentially a creation of pattern in what was blank. 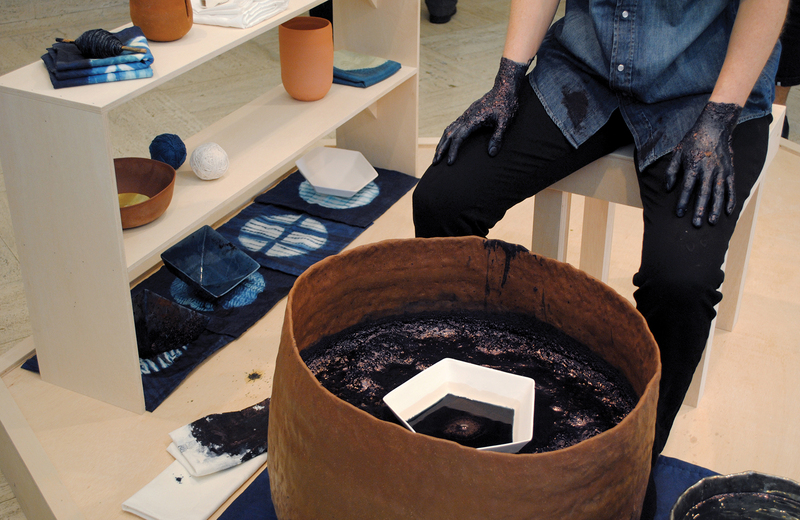 When we begin creation with the physical tools of ceramics for instance – clay, a wheel, plaster – we have referents that are easily transferred to our everyday experience, we can see them before us and put our hands on them. The approach to creation in the digital lacks literal real world referents. But it calls on something that is as basically human and primal as when we first put our hands on clay. It is a call to bring order, form, and pattern to what had been open space. It is the same essential creative impulse, but the digital makes this call from the ether very apparent. The fascination resides in watching the process of creation as a world built on numbers melds with physical reality. Virtual space and physical reality are thus united. It is as natural for some of these makers to grab a mouse as to grab a trimming tool. The gap that existed between them in the past is no longer contentious, it is demolished. Digital fabrication (and the promise of localized, custom, small-scale production) is predicted to disrupt the mass-production model. To the world of makers, craftspeople, and/or artists, who are already outside of that mass-production paradigm, does that make it friend or foe? The assertion that decentralized forms of manufacture could disrupt models of mass-production and commercialism was what originally drew my interest to digital fabrication technologies. I don’t think it’s correct to assert that a decentralized maker is inherently outside of mass-production. Or perhaps it’s more accurate to say that a decentralized maker is not inherently removed from dominant systems of capital, which have been traditionally typified by systems of mass-production since the early craft idealists like Marx and William Morris. The prevailing paradigm of capitalism is no longer only represented by mass-production but by other emerging forms in which decentralized labor is being harnessed for the profit of centralized power structures. This can be seen in sites like Etsy and Thingiverse where individual makers provide content that creates financial value for these central marketplaces. The language of local, custom, small-scale can be used to cloak what essentially remains the same paradigm. Stacy Jo Scott was a featured artist in "Brave New World." We've already published extended conversations with Chris Bathgate, Arthur Hash, Christy Oates, and Anna Walker. Stay tuned for more.